We need your help to create the Even More section of the GWE. Using Google moderator please submit your ideas or vote on topics that interest you most. For some ideas, look in the right column. Jim and Steve will use these ideas to formulate the Even More section of the GWE. 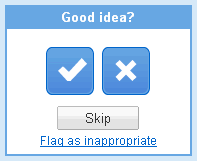 Submit or Vote for Ideas in Google Moderator. Google Apps for Educators Presentation - Great examples of how it differs from a general account by Google Certified Teacher, Kern Kelley.